Once upon a time, having dogs in the office seemed like something out of a tech startup fairy tale; a beaming Yellow Labrador Retriever running up to a handsome CEO in a loft filled with busy engineers, the Golden Gate Bridge glistening through a window. Don’t believe me? Over the next few months we’ll be interviewing people from a variety of cities and industries about how bringing their working dogs to the office has impacted their lives, careers, and mental health. But first, a word from science. 1. Dogs make everything better. Even Excel spreadsheets. 2. Happier employees = more productive employees. 3. Having a dog-friendly workplace creates a welcoming and warm energy, which can help with team building and recruiting. Allowing employees to bring their dogs to work also cuts the potential cost of dog walkers and daycare from their budgets, enabling them to save money five days a week. 4. On a similar note, letting employees bring dogs to work removes the stress of tight time constraints — there’s less pressure to run home to feed or walk the dog at the end of the day. One 2008 survey of both small and big companies showed that dog-friendly offices had employees who were willing to work longer hours as well as lower rates of employee absenteeism. Employees working alongside their dogs are more inclined to stick around, finish work without feeling rushed, and go home when they’re ready. 6. In the same study, researchers found that employees with in-office dogs reported higher productivity. Both of these benefits might be attributed to increased levels of oxytocin, a hormone that decreases stress in the human body. Oxytocin, also known as the “cuddle hormone,” is released when bonding socially, snuggling, or petting and interacting with animals. 7. Dogs foster a more collaborative work environment. Who needs a water cooler when you can gather ‘round a dog? Meet your cute new co-worker over a petting sesh. Everyone bonds over belly rubs. 8. Walking, feeding, or playing with a dog is a nice way to break up your work day. We already know that sitting at a desk for nine hours isn’t great for your health. Taking a walk around the block (or even just to the treats jar at the front of the office) with your pup is an incentive to get moving in the middle of the day. Have a working dog who makes office life better? 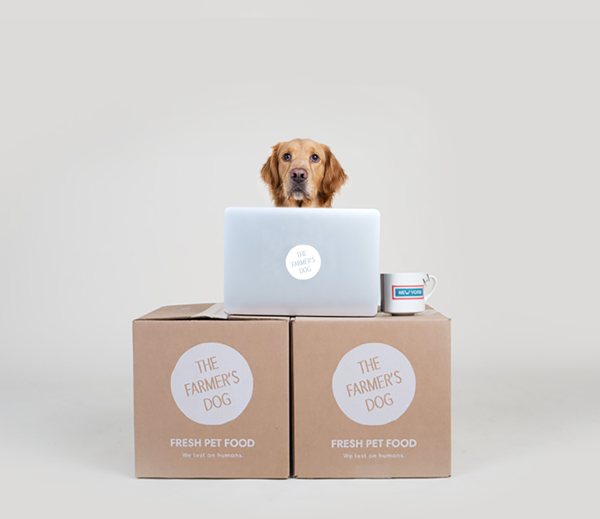 Send resumes to digest@thefarmersdog.com for a shot at being featured in our Working Like a Dog series. Just don’t be too jealous when your fluffy co-worker gets promoted before you do.